I grow boltonia all over my property, but it was the act of digging out a huge clump this afternoon, carefully dividing it, then throwing all of it on my new spring compost pile that made me realize ‘Snowbank’ was the perfect plant for the Spotlight. That’s right, the compost pile. Sacrilege? Not when you own boltonia. This week, go out and buy three small pots of the stuff, plant it in any type of soil, grow it in full sun or part shade, water it properly or forget about it, fertilize it or don’t, and no matter which path you choose, about five years from now you’ll be in the nursery business, specializing in boltonia. It is the perfect perennial. It spreads out quickly after the first year, but is polite about it. The clumps get bigger and bigger, tripling in size each season, but in a non-invasive way. (Seriously. It’s hard to explain.) The clumps don’t die out in the middle, either, they remain full, which means that after four or five years you can have a stand of the stuff that covers ten square feet, easy. And that’s from one plant-you bought three, remember? 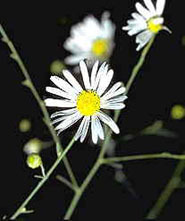 Quick to emerge in spring, ‘Snowbank’ just gets taller and taller all season until fall, when tiny clusters of snow-white flowers fill the plant nearly from head to toe. Narrow leaves and prominent, singular main stems mean that it’s not the most captivating plant in the ol’ arsenal during the summer growing season, but when it blooms in September, oh my.